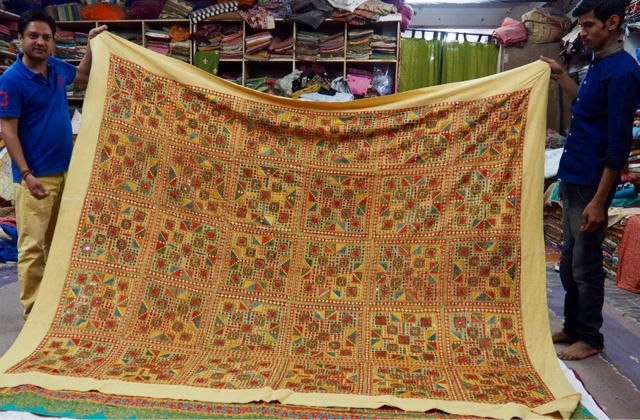 We went to Rajasthan to see textiles, and we had plenty of opportunity to do just that, with varying degrees of orchestration and hidden agendas. 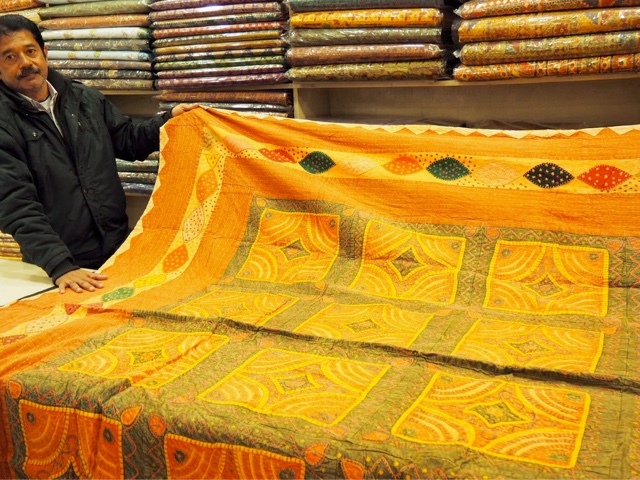 This guy in Jaipur was apparently a textile designer. 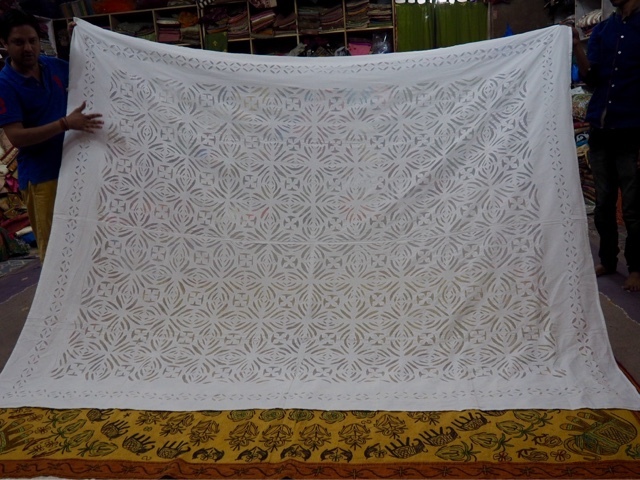 He showed us a huge variety of stunning hand stitched textiles and bed covers in traditional styles, clearly made by local women. So far so good. This was a slick operation, obviously geared up to bus loads of tourists, and the real shame was that he claimed all this work as his own designs. His catchphrase 'look my art' has become our go-to phrase for whenever we feel we're being ripped off (with a couple of letter changes - use your imagination!). 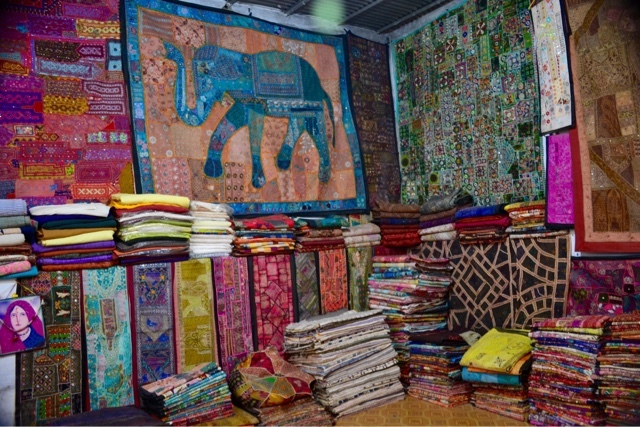 In Pushkar we looked in what appeared to be a tiny shop which opened out into a huge cave of a room with a Hindu shrine in the centre, surrounded by textiles. 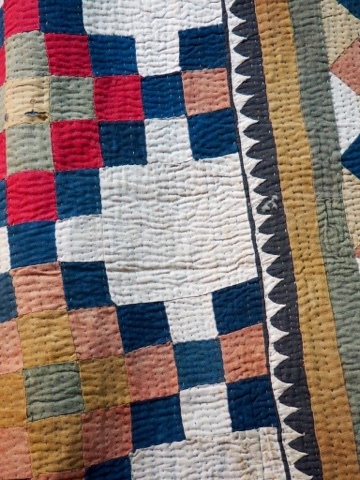 The quilt below is Punjabi and probably over 100 years old. 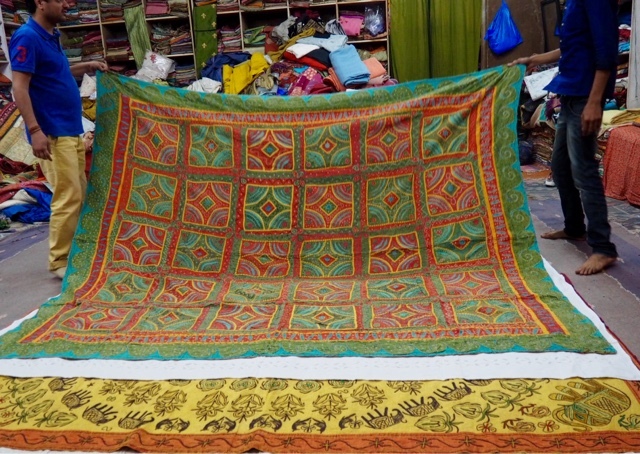 It was huge and the simple kantha style stitching really complemented the now faded colours. 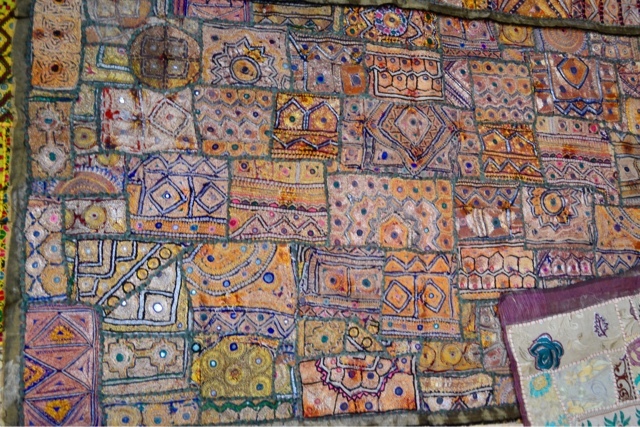 All over you see wallhangings made from recycled tribal dresses, the embroidery on which is a lost art form. Indeed, the guy in Jaipur had many of them that he claimed to have designed himself. 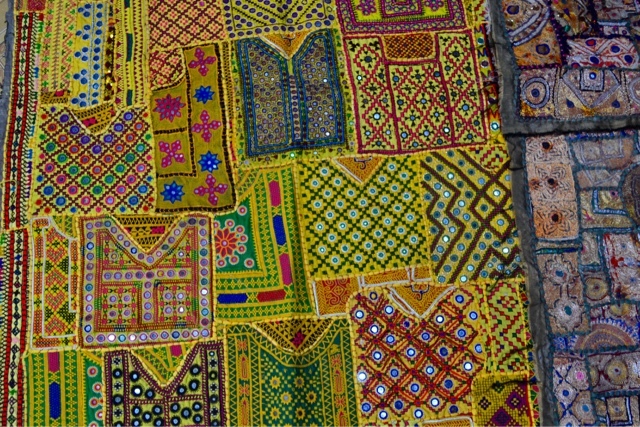 The young guy in the Pushkar shop brought out several and explained which part of India their embroidery came from. Gold thread work from cuffs and bodices in this one comes from a specific region, but I can't remember which now. These were our favourite, being more subtle than the others and often on a dark blue or green background. 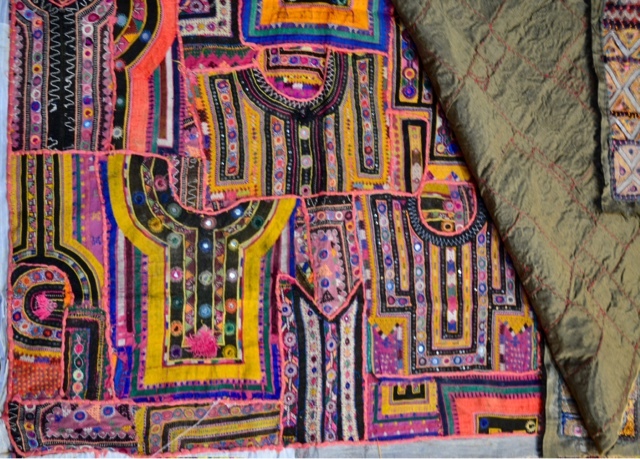 These are traditional Rajasthani embroideries, featuring bright colours and shisha mirrors. The shapes of the collars and yokes can still clearly be seen. Pieces like this are exported, so often seen in England, and it appears that there is an inexhaustible supply of old costumes with which to make them, although that cannot be true. 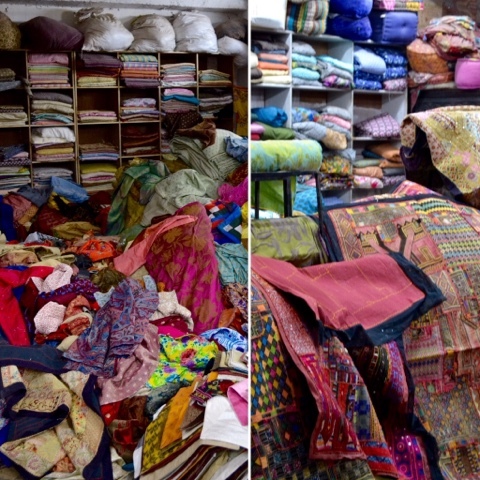 This warehouse in Jodhpur (underneath the hugest junk/antiques shop full of incredibly quirky things) was packed to the ceiling with old and new textiles, mostly for export. Their stash certInly beats ours! It does seem a shame that this is the fate of such beautiful family textiles, but perhaps they were not seen like that by their owners as progress happened. And India is nothing if not expert at recycling everything, so at least they can be appreciated again. 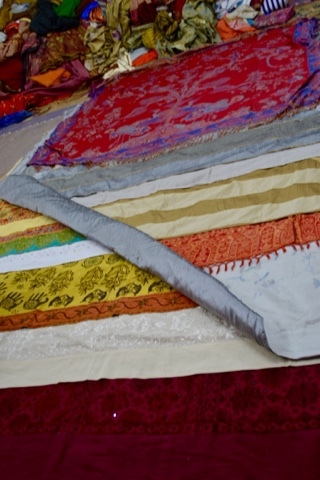 New work is being created for the export market (designers such as Hermes and Miu Miu, and various Italian houses) in the traditional ways, and the manager of the Jodhpur warehouse showed us this selection of bed covers - those at the bottom in this picture are the traditional work, with commissions from design houses in silk and woven throws above. 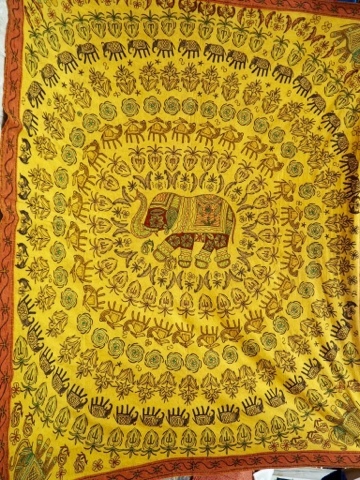 This is local embroidery worked in the home and would have taken six months to complete, using designs of elephants, camels, butterflies and pineapples. These beautiful cut-work covers have organdie backings making them translucent; they'd make great curtains. and this is complex canvas work with shisha mirrors, taking twelve months to complete. 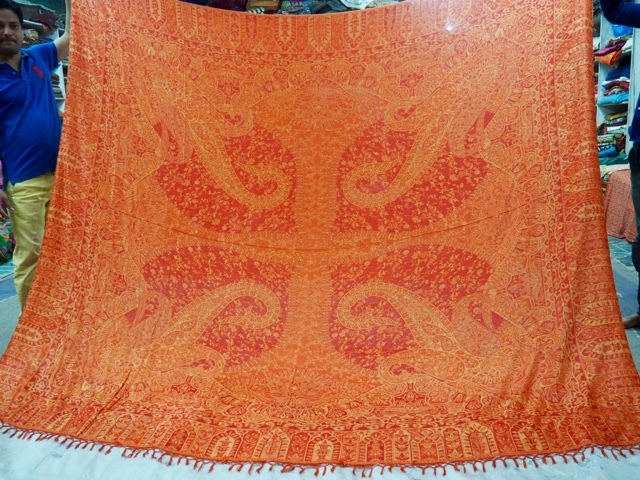 A stunning Kashmiri throw commissioned for a European design house. Perhaps the most amazing thing is that items that we could have purchased for around £100 would sell in Europe, the US or Japan for ten times that price. I think the manager thought that we were buyers, so we didn't disabuse him of that idea, but though sorely tempted we managed to leave without buying anything! That was a first!